We can always count on John Galliano to bring drama to the runway of both his namesake label and that of Christian Dior ... and Fall 2009 Fashion Week was no exception. Models at Christian Dior were seen walking down the runway with multitudes of color on their faces and a makeshift helmet that literally took over 2000 bobby pins to create. While I sometimes think that the makeup at Dior is so over the top it borders on the ridiculous, I'm actually totally feeling what happened this season. 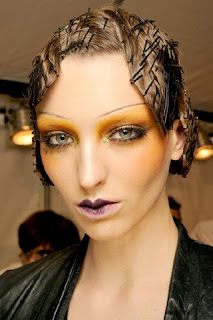 Models sported a variety of different colors both on their faces and their nails in a totally futuristic fashion. Eyeshadow was swept over the lids, up to the browbone and outside the corners, and then accented with a ton of mascara on both the top and bottom lashes to create a long, spiky look. 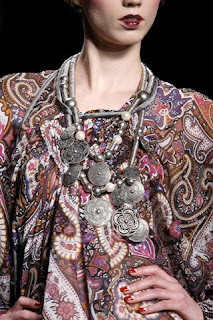 Lips were painted with deep mulberry and purple hues but not filled in all the way, creating an old-time Clara Bow look. And the nails sported moon manicures in a variety of hues -- definitely a huge trend for fall. Check out tons of pictures after the jump. So what do you think of this look? Would you sport it in a toned down manner, or is it best left to the runway? Let me know your thoughts in the comments! I think the eyes are spectacular but the eyebrows are too narrow. As for the lips, the colors are incredible but the definition is best left on the runway. It is too geisha like for me.